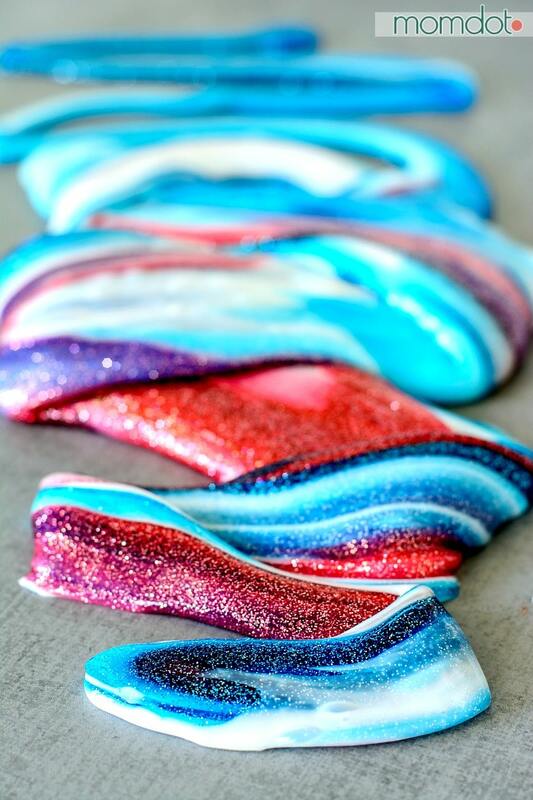 Looking for 4th of July Slime? What I love about slime, is that it’s an endless project. You can make slime to match any holiday, TV show, and book- and it makes the perfect fun day summer DIY that everyone loves to touch! 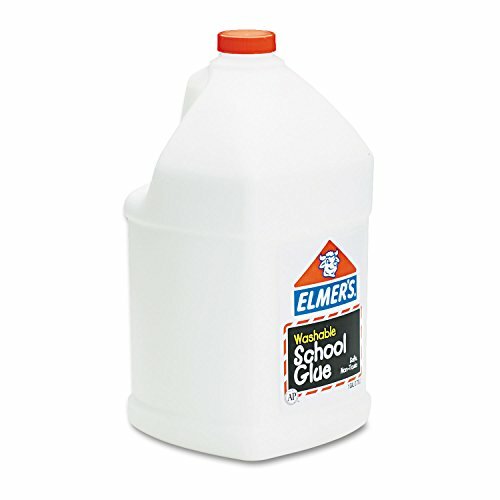 Plus, making slime is easy! If you have missed any other slime tutorial on MomDot, you might want to check out some of these inspiration fun colors as well. Now onto the newest slime recipe! 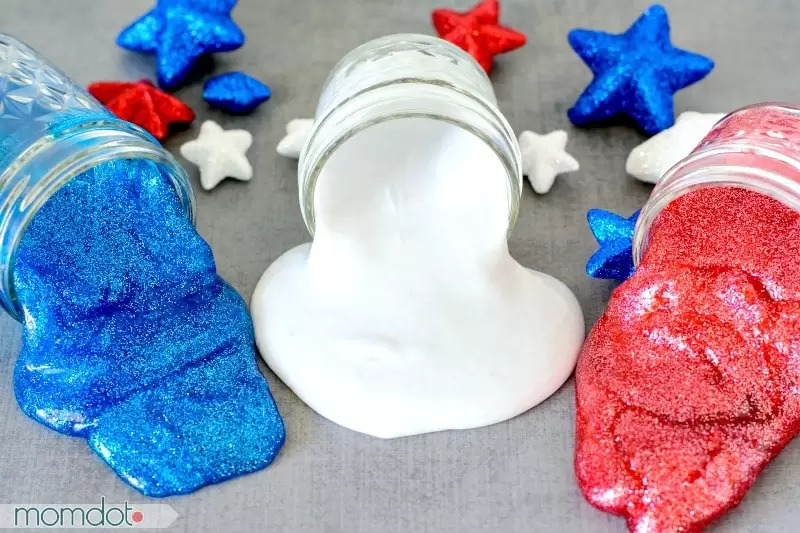 This slime is red, white, and blue- perfect for the upcoming July 4th holiday (or any other patriotic holiday) which is why its named Star Spangled Slime! Totally fun, this red, white and blue slime mixes together to be just a gorgeous array of colors. If you don’t know How to make slime, well I’m gonna show ya! PRO TIP: Many people do not like to deal with borax and water when making slime. You can also make slime by using LIQUID STARCH and glue. It’s a ton easier. Simply use about 1/3rd cup starch in 1/2 cup glue (per color) and add starch little by little until you get the slime consistency you want. Once it’s set, then separate the white slime and dye the colors you want in solo cups. If you already know how to create slime, you can skip this. It makes the same way as all slimes, just mix these gorgeous colors for the result. NOTE: I only use liquid starch ! Add liquid starch. approx 1/4 cup or less. I have a lot of people message me about this and other slime projects, wondering why their slime is so runny compared to mine. I did a live Facebook video that shows you the stages of slime from the goop to the solid mass above you see, so you can make sure you are on the right track. I also address some of the slime issues! Please watch because it will help you grow some confidence and make sure you get it right! Once you have it figured out, making rainbow slime becomes so much easier. Love slime and ooey gooey fun? Do not forget to follow me on Pinterest! <————I share awesome stuff like camo slime and this super easy fluffy slime recipe here.